Measurable gases *4 Natural gas, LPG, Air, etc. Installation Indoor/Outdoor (Drip proof structure) *4.5. *1 Only for temperature compensation models. *2 Only for pressure compensation models. *3 No.1 for actual flow models. Please refer to Manual for Selecting Aichi Turbine Gas Meter Model TBZ Series and TBX Series for more details. *4 Please avoid installing the meter in a place where carbonate substance (C5 or above) from LPG or City Gas, oil mist, and/or dust powder, etc., waft. *5 For outdoor installation, please avoid the meter be splashed with water. 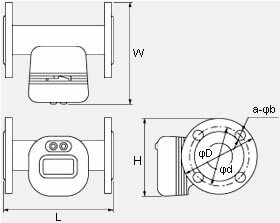 For TBZ series, there are models that have temperature / pressure compensation function. This function is to convert measured actual gas flow to gas flow at certain temperature and / or pressure condition for display, as gas volume changes by variation of temperature and pressure. The relationship between TBZ model and temperature / pressure compensation function is as the following table. Normally, temperature / pressure condition at which measured actual gas flow is compensated will be Temperature 0°C and Pressure 1 atm (1 atmospheric pressure). However, other value could be set in case it is requested (There are condition to select the value). Also, at the time of placing order of TBZ series please kindly select direction of flow from the following table.